There are a lot of cheaper so-called "smart" light bulbs out there, but Philips Hue has held its reputation as one of the better, higher-end choices. Unfortunately, that's also kept its prices comparatively high. So whether you've been looking to jump into the ecosystem or just add a few more lights to your already kitted-out pad, we've spotted some sizable discounts for Hue lights, including a few all-time lows. 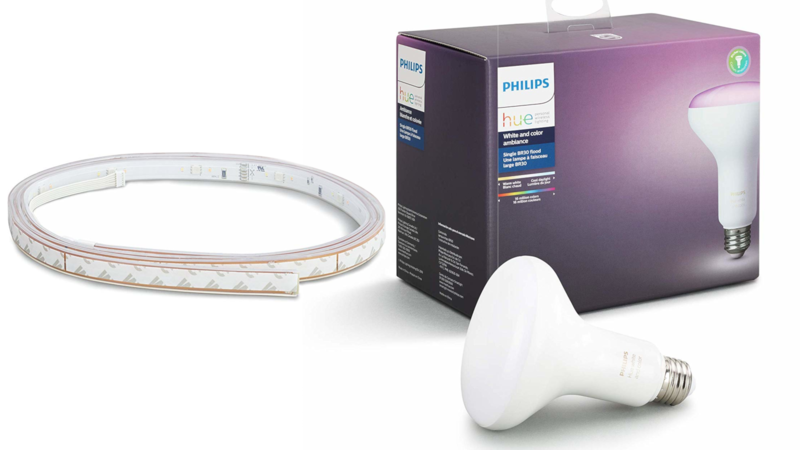 First, we've got the basic, the essential, the fundamental: Philips Hue Single Premium Smart Bulb. For a mere $36 — an all-time low — you can jump into the exciting world of voice-controlled, multicolored lighting, or even just add that extra little bit of necessary ambiance to your guest half-bath (assuming you're willing to also pick up a hub separately). Gotta hide that ugly tile somehow, right? And if you're just looking to expand your indirect lighting via a lightstrip, we've got your back. The so-called "Philips Hue LightStrip Plus Dimmable LED Smart Light Extension" is also at its lowest price. $19.20 buys you 40" of multicolored extension lighting — though, as its name abundantly suggests, this is an extension kit to your existing LightStrip. It isn't an all-time low, but if you're already picking up some smart light goodies over at Amazon, the 2-Bulb Starter Kit has just dropped down under three digits for the first time this year, at a mere $99. It's been a bit cheaper before, as low as $80, but if you're already picking up some of the other stuff, it's a decent discount over the recent $150 price tag. Equipping your home with a smart lighting system might be an expensive proposition, but discounts like these can make it a bit more attainable.